Champions Condo à Branson Golf Resort - Vues, ​​piscine et emplacement! Condo spacieux près des spectacles, des magasins et des restaurants. Ce condo de golf Branson 4BR / BA est en plein dans Branson, moins de 1/4 mile de la bande. Vous pouvez courir à un spectacle, faire du shopping ou frapper le terrain de golf et être de retour dans une minute ou deux. Ce condo est situé en vue du parcours de golf primé Thousand Hills. Ce condo Branson près du complexe de golf dispose de 4 chambres king avec matelas à oreiller moelleux! Chaque chambre a également une salle de bain complète ci-joint! Il y a un grand salon et une immense véranda donnant sur la piscine et sur Branson. Le salon a un canapé-lit et une télévision à écran plat. Nous fournissons des jeux, des jouets et des DVD pour tous les âges. La cuisine est prête pour tous les repas, y compris Thanksgiving. Vous trouverez tout ce dont vous avez besoin: argenterie, contenants de rangement, plusieurs petits appareils ménagers, casseroles, vaisselle et plus encore. La salle à manger a beaucoup de sièges pour tout le groupe pour partager un repas ensemble et discuter des activités des jours. Le plan d'étage ouvert signifie que ceux dans la cuisine sont toujours dans la conversation avec tout le monde dans le salon. La laveuse et la sécheuse dans le condo vous permettra d'emballer légèrement aussi. Marcher sur le terrain de golf primé où les célébrités locales fréquentent. Jouez un match de tennis sur place avec une baignade dans la piscine extérieure pour se rafraîchir. Il y a tellement de choses à faire dans la région de Branson: des centaines de spectacles de théâtre et de musique en direct, des restaurants, des boutiques, des parcs d'attractions, des loisirs de plein air et plus encore. Vous pouvez même marcher jusqu'à un Pizza Hut ou un yaourt glacé à la cerise et aux baies lorsque vous avez envie de vous faire plaisir. Vous trouverez de nombreux restaurants à moins de 2 miles. Lorsque vous êtes prêt à être à la maison, nous fournissons gratuitement wi-fi, jeux, jouets et DVD pour tous les âges dans le condo aussi. Venez profiter du condo Branson, avec de superbes vues et l'emplacement parfait, personne ne doit faire de compromis. qui n'est pas affilié à Branson Vacation Cabins, LLC. Il ya une salle de bain complète pour chaque chambre, donc tout le monde a son propre espace. Serviettes moelleuses vous attendent. The condo was clean had great views and plenty of room for our group. We had no issues at all. I would come back here again and would recommend this condo to anyone! A well-price condo in a good location. The pictures do not convey how roomy this place is. While it is a little dated and showing some use, it is priced right and was perfect for our four-family weekend. Very clean and equipped with everything you need. It's no more than 15 minutes from anything in Branson. Easy to access and the owners were very helpful in providing information on the unit before arrival. We had no issues and it was a great stay. Highly recommended and will use again. When we went to check into the condo the door code was not correct so we could not get in. We called the number listed and they were able to help us get in pretty much immediately and were friendly in doing so. When we entered the condo, we realized that it had not been cleaned from the previous guests. Once again they solved this problem immediately, by having one of their cleaning people come back in after hours (as it was after 4:00 pm) to clean it. I very much appreciate that this person came in extra for us. After she cleaned, overall most of it seemed clean, but some things were left undone (ie living rug not swept, kitchen floor still kind of dirty). We took care of these problems ourselves. 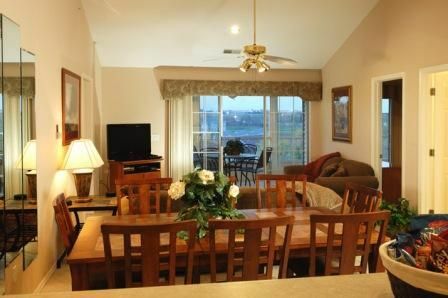 As far as the condo itself, it is nicely furnished and overall pretty clean. It is in a wonderful location with a swimming pool (which was closed as it was October) and a nice tennis court. The main room is pretty crowded with the dining room table, but was okay. My biggest suggestion for the owners is that because the porch lights outside are extremely bright, heavy curtains are needed in the front 2 bedrooms. The blinds just don't do the trick. My husband and I always sleep with the bathroom light on at home shining some light into our bedroom, but even we had trouble sleeping in the room. The last night we strung the bedspread up on the window to darken the room and slept much better. One night I woke up at 2:00 AM and thought it was morning. My other suggestion is to put up towel bars at the bathroom sinks. We were in the front bedroom which has very little counter space compared to the others and we were frustrated that we had the towel laying on what little counter space we had.This would be a pretty easy fix. Overall, I was pleased with condo. The bedrooms and bathrooms were good. Its wonderful location and nice furnishings made up for a little bit of a cramped kitchen, dining room, living room area. I would recommend this condo to those wanting to rent in town. We felt really bad that we had overlooked your check in that day and did not have the condo ready. We appreciate your patience in allowing us to get that ready for you. I have passed on the problems with the outside light coming in and the owner of the condo will be getting some better window coverings to take care of that situation. Again, sorry for any inconvenience. We really appreciate you feedback, that will help us provide future guests with a wonderful stay. Very nice well equipped nice location !! !LOVED IT. Clean! Plenty of room for our family! Well equipped! Met all our needs! Guests say time and time again; location and space for the price are great! Thank you! I hope you stay with us again! Branson est un endroit merveilleux de voir la beauté des Ozarks avec le luxe de divertissement et des activités pour tous! Ce condo est situé juste à côté de la célèbre bande Branson, à distance de marche du golf et des restaurants et à quelques minutes en voiture de tonnes d'activités, shopping, spectacles, activités de plein air et salle à manger. Ce très pratique dans un endroit de la ville pour épargner du temps de conduite et vous laisse avec le temps plus amusant.